Crews using chainsaws and heavy equipment were working quickly Wednesday to clear debris from Sandy Point State Park in Annapolis so it can reopen for swimming. Debris washed up along Chesapeake Bay after recent torrential rains prompted officials to open the floodgates of the Conowingo Dam. That sent a deluge of water, trash, trees, sticks, a crab house and even a chicken coop down the Susquehanna River and into the bay. 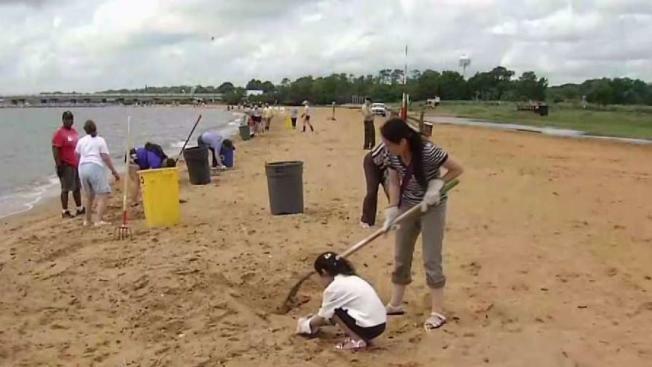 Since the rubbish showed up on the beaches of Sandy Point, swimming has not been allowed. The park remains open for non-swimming activities like fishing, and boaters can still launch from the park's boat ramps but are advised to be cautious of submerged trash and wood beneath the surface. Maryland’s Department of Natural Resources has organized volunteer clean up days at Sandy Point on Thursday and Saturday at 9 a.m. Volunteers have been asked to register in advance on its website. 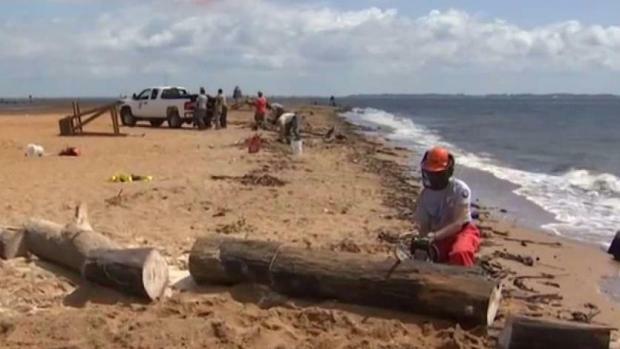 Crews using chainsaws and heavy equipment were working quickly Wednesday to clear debris from the Sandy Point State Park so it can reopen for swimming. The cleanup effort has lasted for days after a dam release dumped trash, trees and other debris into the Chesapeake Bay. Gov. Larry Hogan announced Wednesday that the Governor’s Cup yacht race would be canceled because of the influx of debris. The organizer of the Bassmaster Elite Series, a professional bass fishing tournament on the Upper Chesapeake in Harford County, announced it would postpone its event this year. The Knowles family from Takoma Park, who brought Alex, 2, and his 7-month-old sister Zelda to go swimming at Sandy Point on Wednesday, had to make do on the shore. Crews cleaned the Annapolis City Dock for a third day. They have been working eight-hour cleaning shifts using pitchforks and other tools to clear the area. So far, they’ve filled 22 truckloads with debris, said Stan Mathey, a watch commander in the Harbormaster’s Office. The area known as Ego Alley looked mostly back to normal Wednesday. Debris is thinning elsewhere too, and some noticed the improvement.